What a joy to utter the name! What a thrill in the heart. I have never had a vision of him and hardly read a line of his poetry, yet - picture him and what do I see? Smiles! One big smile, bearing joy to all who greet him. He is like sunshine, bringing comfort and courage. In my days of darkness he was with me, guiding me, encouraging me, showing me the way, always smiling, always cheerful. 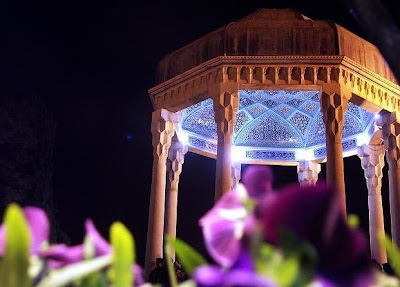 When I look at the beautiful trees and pleasant meadows of sunny California, I picture him in his rose garden at Shiraz and feel that, had he not been born where and when he was, this country with its lovely scenery and beautiful weather would have brought inspiration to his heart, and ode upon ode would have resulted. Allons, Hafiz! To study your works together! Reminding me of thee, Hafiz. Hafiz is always young. Not a boy or youth, but in early manhood. He has the spirit and enthusiasm of the child and youth with the wisdom of experience.